1. Kosher for Passover Pizza Sauce and Pasta Sauce from the Freiner Corp., in Israel, which bear the end use date of 24/12/2009, contain canola oil and mistakenly do not state that they are “Kosher For Passover Exclusively For Those Who Eat Kitniyos,” as required by law. 2. Manischewitz Tam Tam Crackers—Whole Grain Garden Herb (R.A.B. Food Group, LLC., Jersey City, NJ) are being made again this year. They were not last year. If found, they will properly labeled “OU-P-Kosher For Passover” despite the listing of “Passover Whole Wheat Flour” as an ingredient. In fact, the company is using Passover Matzo, not flour. After the matzo is baked, it is mixed with cottonseed oil in the making of the Tam Tams. This product is non-gebroks. 3. Soda certified by the "cRc" (Chicago Rabbinical Council) for Pesach will bear the "cRc" symbol with a "P-O9" next to it. Some Pesach-certified labels may list "corn syrup and/or sugar" on the label. The bottling company prints labels in this manner to allow the same label to be used year round. All "cRc" Pesach-certified products are free of any kitniyos. 4. Honey imported from Turkey, even when bearing a kosher symbol, should be suspected all year round for adulteration. 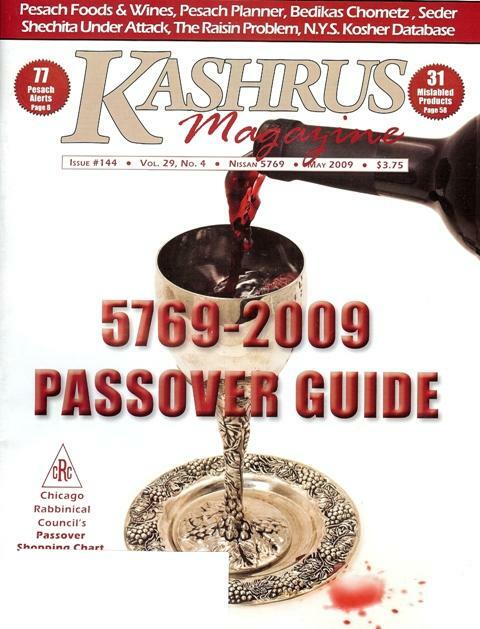 For Passover it should not be used without proper Kosher for Passover certification. One brand of “honey” produced in Turkey was found to contain 100% corn or cane syrup — no honey whatsoever was found in the product. The kosher certification displayed was unauthorized. § All pill medication – with or without chametz – that one swallows is permitted. Vitamins and food supplements do not necessarily fall into this category (even when they are in pill form), and each person should consult with his Rabbi. § Liquid and chewable medications (or pills coated with a flavored coating) that may contain chametz should only be used under the direction of a Doctor and Rabbi, who will judge the severity of the illness, the likelihood that the medicine contains chametz, and the possibility of substituting a swallowable pill. Important: Do not discontinue use of liquid, chewable or any other medicine without consulting with your Doctor and Rabbi. § Liquid and chewable medications that are chametz-free but contain kitnios, may be consumed by someone who is ill. A healthy person, who would like to consume this type of medicine to merely relieve a minor discomfort, should only do so if the product is known to be free of both chametz and kitnios. § All varieties of blush, body soap, creams, eye shadow, eyeliner, face powder, foot powder, ink, lotions, mascara, nail polish, ointments, paint, shampoo, and stick deodorant are permitted for use on Pesach – regardless of the ingredients contained within them. § Many liquid deodorants, colognes, aftershaves, perfumes and hairsprays contain denatured alcohol, and therefore should not be used on Pesach unless they are listed as chametz-free on a reliable list of approved Pesach products. § Lipstick, mouthwash and toothpaste that contain chametz should not be used. Insect infestation has been noted in varying degrees from a wide variety of sources worldwide. Gefen brand Raisins (certified by the Volover Rav) and Mishpacha brand Raisins (certified by the Nirbater Rav) were recalled by their rabbonim hamachshirim. Kashrus agencies and insect specialists are investigating and interim reports have been issued, but the investigation continues. See partial statements below. Contact the agencies for their complete statements. All agencies advise consumers and merchants to be careful in the storage of all products including raisins and they are continuing to investigate the degree of infestation in raisins. QUESTION: I thought that this matter was resolved weeks ago. Why is KASHRUS continuing to discuss the matter? KASHRUS: Kashrus agencies were quick to respond to the public to deal with this matter in a prompt and efficient way. One function of kashrus supervisory agencies is to communicate with the public. They must decide whether to ban or to permit the use of such products for their certifications and for the public at large. Unless there is conclusive proof for the need to ban, many will continue to permit their use. 2. When do the insects come on to the grape? Are they entering into the grapes while they are on the vine or when they are being dried? Do many remain outside? 3. Are these insects just pests that enter in during storing and every producer must properly store its products and consumer need keep an open eye for gross infestation? 4. Do we have a miut hamatzui (significant minority of the time insects are found) or at least a constant miut (not enough to qualify for miut hamatzui—10% of the time, but a troublesome amount of the time). 5. In which fields/growing countries is this problem most significant? Can we isolate those and use the rest? 6. The main source permitting the use of raisins with such unresolved concerns is the Taz (84:12). Other sources argue over how to understand the Taz (such as the Pri Megadim, Minchas Yaakov). Does this halachic concern affect us with the raisins? KASHRUS included the opinions of 10 leading kashrus agencies in the article. See the print version for the complete article.